Want to skip to the results? View the Noda Heights Properties website HERE. 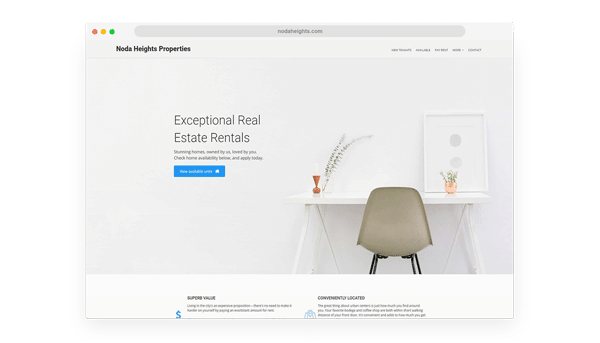 Noda Heights Properties approached us looking for a website that followed the same design and structure as their sister company’s website, one that we had built several months prior. The website needed to service two different audiences: their tenants, and new potential tenants. For Noda Heights Properties tenants, the website had to service as many of their needs as possible, to reduce the support load on the Noda Heights Properties team. Tenants needed to be able to find maintenance information, move-out resources and be able to pay rent. For potential tenants, which the website was focusing on for primary messaging, the site website needed to show off the properties available. New tenants would be able to see what’s on offer, how much the properties cost, what’s unique about the locations as well as provide an option for applying to rent the properties. Because Noda Heights Properties opted for using a similar design and structure to their sister company, the bulk of our work involved updating messaging, branding and content. The messaging updates involved ensuring the site was completely tailored to the local area, as well as ensuring users had any additional information for the area that didn’t relate to the sister website. Noda Heights Properties were extremely happy with the results of the website. They now have a website and messaging that represents the brand and the properties that the business represents. Since the launch, the website has had increased interest versus their old website. To view the Noda Heights Properties website, just click HERE.